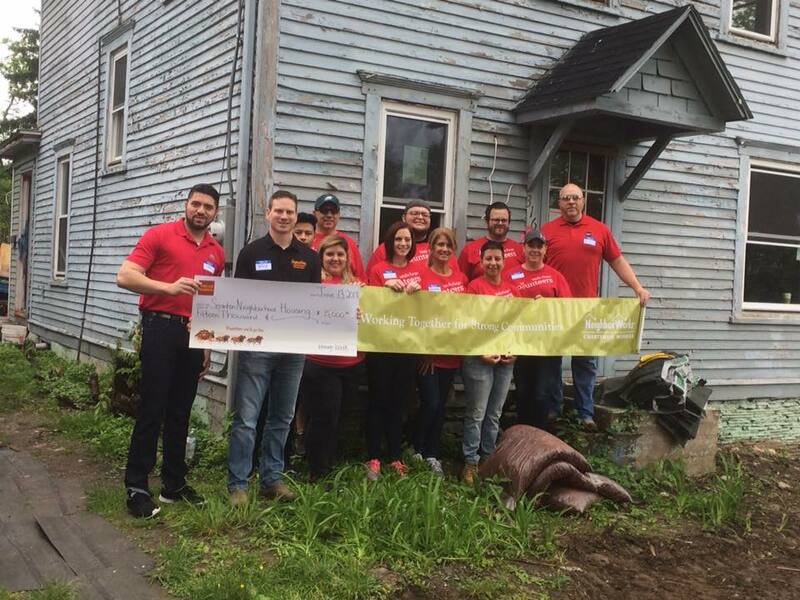 Over a dozen employees from Wells Fargo Bank branches throughout northeastern Pennsylvania recently assisted NeighborWorks Northeastern Pennsylvania with the renovation of a property located at 316 Summit Avenue in Clarks Summit Borough. They were participating in Wells Fargo’s Team Member Volunteer Program, which offers employees of the bank an opportunity to give back to their community through various volunteer activities and neighborhood improvement projects. Volunteers spent the day clearing the property of brush, landscaping, and preparing the site for lawn seeding to take place in the coming weeks. In addition to the significant amount of volunteer labor, a check for $15,000 from the Wells Fargo Housing Foundation was presented for use towards improvements to the property. Pictured, front (left to right): Oiram Santos, Wells Fargo District Manager; Jesse Ergott, NWNEPA CEO; Marianna Yafar, Gretchen Swartwood, Jannette Moran, Blayre Harvey, Jodi Cegelka. Back: Cristopher Pachay, Joe Montagna, Clayton Casino, Bill Latshaw and Michael Poremba.